Virtually all the deans of law schools in California, of ABA-accredited and California-accredited schools, have come out in favor, at multiple stages, of lowering the cut score for the California bar exam. The score, 144, is the second-highest in the country and has long been this high. 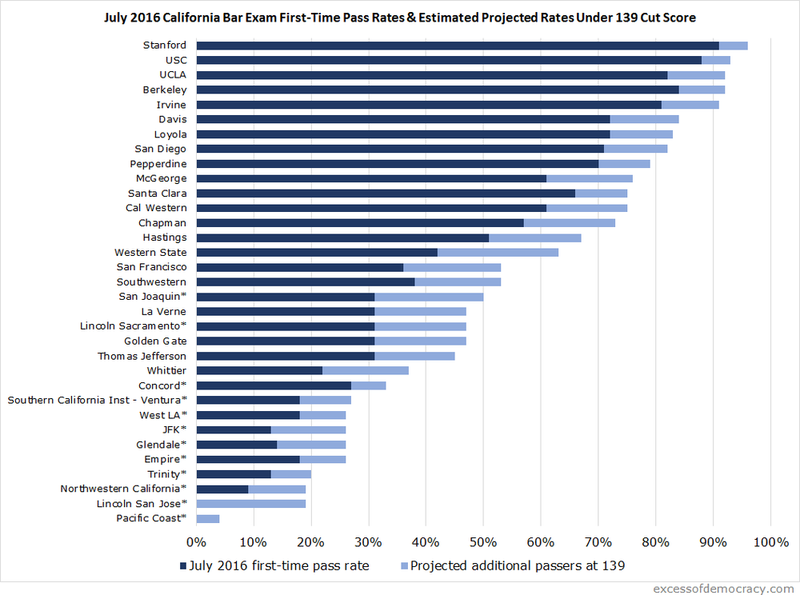 Given the size of California and the number of test-takers each year, even modest changes could result in hundreds of new first-time passers each test administration. The State Bar, in a narrowly-divided 6-5 vote, recommended three options to the California Supreme Court: keep the score; lower it to 141.1; or lower it to 139. As I watched the hearing, the dissenters seemed more in favor of keeping it at 144. At least some of the supporters seem inclined to support the 139 score, or something even lower, but recognized the limitations of securing a majority vote on an issue. Essentially, however, the State Bar adopted the staff recommendation and offered these options to the California Supreme Court. What surprised me, however, is that there would be such unanimity among law deans, because the impact on legal education could be quite significant--and not benefit all institutions equally. Put another way, I understand the obvious short-term benefit for all institutions--some number of law school graduates who previously might have failed the exam would pass, redounding to the benefit of the institution and those graduating classes. But that, in part, assumes that present circumstances remain the same. Invariably, they will not. Let me set up a few things that are likely to occur, and then game out some of the possible impacts these changes might have on legal education--all on the assumption that the cut score drops from 144 to 139. First, the number of passers will increase fairly significantly. About 3480 people passed the bar when 8150 took it in July 2016 bar exam. That included about 3000 first-time passers among 5400 first-time test-takers. Bar test-takers are also up significantly this test (in part likely because of the reduction from three days to two). We should expect that number in this cohort to rise to about 4100 passing--and probably more this administration, given that there were more test-takers. We may expect more out-of-state attorneys, or people who'd failed and given up, to start attempting the test again. Statistics also indicate that the greatest increase in new attorneys will tend to be racial minorities, who have historically passed the bar exam at lower rates. Additionally, we know that this year's test-takers scored better nationwide. If that trend translates to California, too, we would expect a few hundred more on top of that figure. And we may also expect an increase of test-takers to linger for a long period of time if more people are attracted to California because of it has a modestly easier test to pass. This obviously, in the very short term, primarily benefits those students who scored between a 139 and a 144, but would have failed the bar exam, and schools with those student populations. In the slightly longer term, it will benefit students who scored less than a 139 and on repeat have a much higher chance of securing a 139 than a 144. Professor Robert Anderson and I also indicated that we would expect more attorneys who would face discipline. Currently, we estimate those who score a 144 on the bar exam ultimately face a career likelihood of facing discipline at around 9%. (This compares to the overall likelihood of about 5% at 35 years since admission to the bar.) Those with a 139, we project, would likely face a career likelihood of facing discipline at around 12%. The entering cohort would have a somewhat higher likelihood of facing career discipline at some point a 35-year career. Finally, some law schools will disproportionately benefit, typically those schools at the lower end of the performance—but not whose student bodies perform at the very bottom among law schools. If the cut score is lowered from 144 to 139, schools who had a significant “middle” of the curve, with the bulk of their graduates scoring in a range around 135 to 145, should see the bulk of improvement. The chart below illustrates a very rough projection of the improvement in performance of each school from the July 2016 bar exam if the score had been lowered to 139. This is very rough because many factors, particularly the distribution of the students at each school, and should be taken only as rough estimates—any figure could easily be a few percentage points higher or lower; and complicating the estimate is that the July 2017 results would, of course, look different. I’m simply trying to fit the projection to last year for some reference. As you can see, in that middle band of 12 schools, those between Cal Western and Whittier, we would expect to see gains ranging from 14 to 21 points. The 11 schools at the top of the chart would generally see more modest gains of around 8 to 12 points. The 10 schools at the bottom of the chart would also see more modest improvement, typically 6 to 11 points. (The asterisks on the chart are notations for California schools that are not accredited by the American Bar Association.) There are over 50 law schools in California, but not all had sufficient test-takers to be reported in the California data. At least some law schools will admit larger classes. To the extent law schools were reluctant to admit larger classes because of concerns about bar passage rates, those schools will be more inclined to admit larger student bodies. Of course, there are still other reasons that schools may not increase their class sizes, or at least not substantially—they are concerned about their LSAT and UGPA medians for USNWR rankings purposes, they may be worried about finding meaningful legal employment for a larger number of graduates, and so on. But, at least one barrier in the admissions calculus has been partially removed. Higher-ranked law schools may begin admitting more students that recently historically matriculated to lower-ranked law schools. That is, a new kind of competition may begin. In light of the thought mentioned above, it may not simply be that schools admit larger classes; they may be grabbing applicants who would have attended lower-ranked schools. This would exert downward pressure on lower-ranked schools in the event that competition for their prospective students increased. Higher-ranked law schools may see improved racial diversity profiles among incoming classes, potentially at the expense of lower-ranked schools. This is good news for highly-ranked schools and students from racially diverse backgrounds. The lower score will tend to benefit racial minorities, as the data has shown that minorities fail the bar at higher rates. So highly-ranked schools can admit more diverse student bodies with greater confidence of their success. Of course, this will exert downward pressure on lower-ranked schools, who may see their diversity applicant pools dwindle or face pools of applicants with worse predictors than in past years. Law schools will experience more price sensitivity from prospective law students. That is, the value of the law degree should decline in California, as the volume of attorneys increases and the price for lawyers drops. That should, in turn, make law students more skeptical of the existing value proposition of a law degree. Law schools that have relied on high tuition prices have benefited from the high bar exam cut score, because opportunities for attorneys have been relatively scarce; the drop in cut score will dilute the value of the degree and perhaps require some cost-cutting at law schools. This is not to say that an artificial constriction on the supply of lawyers is a good thing because it props up costs (in my personal view, I think it's quite a bad thing); but, it is to say that lowering the score will have the effect of making cost-sensitivity an increasing possibility. 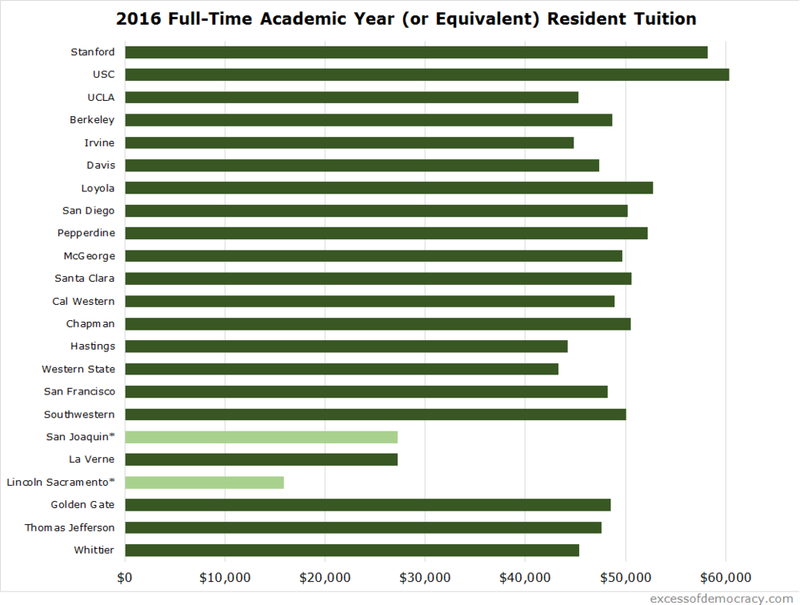 (It's worth noting in the chart above that an institution like La Verne, which charges much lower tuition than peer institutions, may see a similar benefit.) For those who oppose the regulatory burden of ABA-accreditation and wish that non-accredited institutions have an opportunity to thrive, California (with more than 30 non-ABA-accredited schools) may offer a more meaningful experiment in that effort if the cut score is lowered. Negative impact in USNWR for elite schools, and positive impact in USNWR for more marginal schools. This category may not be immediately obvious to observers considering bar exam pass rates. That is, some might ask, wouldn't higher bar exam passing rates improve a school's USNWR profile? Not necessarily--particularly not if the overall passing rate increases. USNWR measures bar pass rate not in absolute terms but in relative terms--the margin between a school's first-time passing rate in a jurisdiction and that jurisdiction's overall pass rates. If School A has a passing rate of 90% and School B 75%, showing some gap that's only part of the story: School A had a 90% rate in a jurisdiction with an overall rate of 60%, which means it actually did quite well; but School B had a 75% rate in a jurisdiction with an overall rate of 80%, which means it actually did poorly. USNWR measures that relative performance. UPDATE: I edited this for some clarity in the hypothetical. So if School A sees its passing rate increase to 93%, but the jurisdiction's overall passing rate increases to 85%, that's bad for School A in USNWR terms--its ability to outshine others in the jurisdiction has dwindled. In a state as large as California and with such a relatively low first-time overall passing rate, this gives elite schools an opportunity to shine. Stanford, for instance, boasted a 91% first-time bar passage rate in a jurisdiction with a 56.3% first-time pass rate, a 1.62 ratio. If the bar pass cut score is dropped to 139, the bar projects a first-time pass rate of 64.5%. Even if its pass rate increases to a projected 96%, its ratio drops to 1.49, a 0.12-point drop. The same holds true for institutions like USC (-0.08), UCLA (-0.03), and Berkeley (-0.06). These are just one factor in the USNWR ratings, and these figures are ultimately normalized and compared with other institutions nationally, but it will marginally hurt each of these schools as an institution in the rankings--even though it might benefit a small cohort of graduates each year taking the bar exam. In contrast, schools that have had below-average bar exam performance would see a significant increase—some of them in my projections moving up 0.2 points in their ratios or even more. If the school is in the unranked tier, it might help get the school into the rankings; if they are ranked lower, it might help them move up the rankings, an added benefit to their graduates passing the bar at higher rates. I’ll emphasize what I’ve mentioned repeatedly before but is too often lost when blog posts like this are shared. I have no particularly strong views about what the bar exam cut score ought to be—where it is, a little lower, much lower, or anything else. There are costs and benefits that go along with that, and they are judgments I confess I find myself unable to adequately assess. But, these are my preliminarily thoughts on things that might happen if the cut score were dropped to 139. Granted, they are contingent on many other things, and it is quite possible that many of them do not happen. But they are a somewhat-evidence-based look at the future. And they show that the change in cut score may disproportionately affect some institutions in ways beyond the short-term bar exam results of cohorts of graduating law students. Time will tell how wrong I am!